The FYI app is designed to provide the optimal viewing experience based on your connection speed. If your connection is too slow, the video quality will be lessened, or in some cases, removed altogether, providing an audio-only experience. 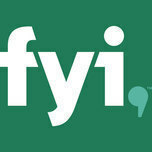 Using a consistent broadband connection will help ensure the highest quality video within the FYI app.